We have put together a number of Frequently Asked Questions, to help you understand more about the Marine Park in Malta and its services. This page is updated regularly as and when questions are raised which we feel are pertinent to the Marine Park visitors and our numerous clients. We invite all guests or potential guests to go through these questions as they will prepare you for your visit to the park. In the meantime our staff may be contacted through our contact form to clarify any further questions that you may have. (Question 1) Is the Marine Park open all year round ? Answer: Although the Park keeps on operating all year round by the veterinarians and other staff who have to care of the dolphins, sea lions, parrots and reptiles, it is not open to the public/guests all year. Opening periods/hours usually change year on year. (Question 2) Your website shows different seasons, what are these ? Answer: Seasons are based on low, shoulder and peak months. In Low Season prices for all activities are cheaper and during certain periods activities are limited, whilst in Shoulder & High Seasons prices for all activities are generally more expensive due to the high demand. (Question 3) What are the booking fees ? Answer: The booking fees are applied to cover for payment and processing fees so that you can pre-book your activity at the park and we can secure your place on the selected date of the activity. Due to limited availability, especially on Swims with Dolphins and Interaction Programmes, pre-booking is highly recommended to secure a place. Please note that activity times are allocated by the park attendants after booking, as soon as your activity has been allocated a time slot we will send you an email update. (Question 4) What does the Day Show Block Ticket include and at what time should I be at the Marine Park ? Answer: The Day Show Block Ticket includes Entrance to the Park & entrance to the Dolphin Show Presentation, The Seal Lion Show Presentation , The Parrot Show Presentation and The Reptile House. Note For Day Show Block Tickets – Senior Citizens are considered to be over Age 65, Adults are considered to be persons between the Age of 13 and 64, Children are considered to be persons between the Age of 4 and 12, and Infants are considered to be persons between newborn and the Age of 3. Infants are allowed free entrance to the Park, whilst Senior Citizens are kindly requested to contact us for a special rate prior to booking. If your booking is between April and September then you should be at the Park at 0930hrs if you intend to attend the morning shows, alternatively you should be at the Park at 1415hrs if you intend to attend the afternoon shows. If your booking is between January and March or October and December you should be at the Park at 1030hrs. (Question 5) What does the Swim With Dolphins Ticket include and how do I Choose a Time for my Activity ? Answer: Activity times are allocated by the park attendants after booking, as soon as your activity has been allocated a time slot we will send you an email update. The Swim With Dolphins Ticket includes Entrance to the Park and entrance to the Dolphin Show Presentation, The Seal Lion Show Presentation, The Parrot Show Presentation, The Reptile House and a Swim With Dolphins. You should be at the park at least 30 minutes before the scheduled swim time. Please note that the actual swim time is subject to confirmation by us, as each swim is limited to a maximum mixed group size of up to 12 persons, so although you would have booked for a particular date, please wait for us to confirm the time of the swim which we will send to you as soon your activity has been allocated a time slot. There are usually 3 or more Swim with Dolphin sessions per day, in the mornings as well as the afternoons. Each swim lasts for approximately 30 minutes. Note For Swim With Dolphins Tickets – Adults are considered to be persons over the Age of 13 and Children are considered to be persons between the Age of 8 and 12. All Children Under the Age of 12, are to present a copy of their passport or an official document which indicates their age at the entrance of the Park, failure to produce an acceptable document will result in the Child NOT being allowed to participate in the Swim With Dolphins. Children Under the Age of 8 will NOT be allowed to Swim With Dolphins. Kindly note that ALL guests participating in the Swim With Dolphins will NOT be allowed in the pool with any accessories such as earrings, piercings, bracelets, hair bands, make-up, etc. Participants to the Swim Programme will be provided with and will only be allowed to use the Park’s wetsuits for hygenic reasons. Wetsuits provided by the Park have long sleeves, full trousers length and sizes of suits range from S to XXL. (Question 6) What does the Swim With Dolphins Spectator Ticket include and at what time should I be at the Marine Park ? Answer: The Swim With Dolphins Spectator Ticket allows you to watch the Swimmer in your booking/party Swim With Dolphins and also includes entrance to the park and entrance to the Dolphin Show Presentation, The Seal Lion Show Presentation, The Parrot Show Presentation and the Reptile House. You should be at the park at least 30 minutes before the scheduled swim time. Note For Swim With Dolphins Spectator Tickets – Senior Citizens are considered to be over Age 65, Adults are considered to be persons between the Age of 13 and 64 and Children are considered to be persons between the Age of 4 and 12. Senior Citizens are kindly requested to contact us for a special rate prior to booking. (Question 7) What does the Interactive Programme Ticket include and and how do I Choose a Time for my Activity ? Answer: Activity times are allocated by the park attendants after booking, as soon as your activity has been allocated a time slot we will send you an email update. The Dolphin, Sea Lion and Parrot Interactive Programme Tickets (whether purchased separately or together) includes Entrance to the Park & and entrance to the Dolphin Show Presentation, The Seal Lion Show Presentation, The Parrot Show Presentation, The Reptile House and the Dolphin Dry Interactive Programme, and/or the Sea Lion Dry Interactive Programme, and/or the Parrot Dry Interactive Programme. Please note that the actual time of the Interactive Programme/s is subject to confirmation by us, as each programme is limited to a maximum group size, so although you would have booked for a particular date, please wait for us to confirm the time of the Interactive Programme which we will send to you as soon your activity has been allocated a time slot. Note that Children must be at least 6 years of Age to participate in the Interactive Programmes. (Question 8) I will be coming to the Marine Park with very young children or infants, do the Park staff provide baby sitting services? Answer: Unfortunately baby sitting services are not provided at the park. Please contact us prior to booking if both parents wish to swim with dolphins and there is no other adult spectator or a child of suitable age to take care of the infant/s in the same session you wish to book. Our staff will check whether it is possible (subject to availability) to have the parents swim in different sessions on the same day, in order to have one parent with the infant/s at all times. (Question 9) I will be coming to the Marine Park with very young children or infants, do I need to pay entrance fees for them? Answer: Infants and Children up to the Age of 3 may enter the Park free of charge. (Question 10) I will be coming to the Marine Park with very young children or infants and I have booked transport to the Park, do I need to pay transport fees for them? Answer: If your infant or child occupies a seat, then you will need to pay transport for them. Transport must be paid by adults, children & infants over 2 years. (Question 11) I booked Transport from my Hotel to the Marine Park, however I do not know at what time I will be collected ? Answer: The Park Vans collect guests from leading 3, 4 and 5 star hotels in Malta only and transport is not available from apartments, villas or aparthotels. The exact time of pick up can vary as this depends on how many guests have booked transport to the Park and whether they have booked Day Show Block Tickets or Swim With Dolphins Tickets. Our staff will inform you of the approximate time of pick up from your hotel closer to the activity date, however as a general rule the Park Vans collect guests between 0830hrs and 0945hrs in the morning unless you are notified otherwise. If you are uncertain whether the park vans stop at your hotel, please contact us by email during office hours (Monday to Friday between 0900hrs and 1700hrs). (Question 12) Can I book transport to the Marine Park if I am staying at a Private Property ? Answer: Unfortunately not. Transport to the Park is only available from leading 3, 4 and 5 Star Hotels in Malta. (Question 13) I am arriving to Malta on a Cruise Liner, Can I book transport to the Marine Park from the Port ? Answer: Unfortunately not. Transport to the Park is only available from leading 3, 4 and 5 Star Hotels in Malta. However you may make your own arrangements to get to the Park, there will be numerous Taxis at the Port. (Question 14) I am booking at a Hotel in Valletta or Mdina, Can I book transport to the Marine Park from any hotel in these two cities? Answer: Valletta is Malta’s capital city, whilst Mdina has limited road access and getting in and out of both these cities at certain hours of the day is not always possible and can cause delays in collecting clients. Therefore all Transport picks ups for clients staying at Valletta Hotels are done from the Phoenicia Hotel and/or Castille Hotel, whilst all Transport picks ups for clients staying at Mdina Hotels are done from the Main Entrance Gate to Mdina. In case of difficulty please contact us by email during office hours (Monday to Friday between 0900hrs and 1700hrs). (Question 15) Can I use Public Transport to get to the Marine Park ? Answer: Yes. You can make your way to the Park by public transport buses that stop directly in front of the Park, which is situated exactly next door to the Splash & Fun Slide Park. (Question 16) I have rented a car and wish to drive to the Marine Park – how easy is it to get to the Marine Park and is a Car Park available ? Answer: It is very easy to get to the Park, depending on the town you are driving from, you have to follow the signs to Bahar Ic Caghaq which is on the coast between St Julians and St Pauls Bay. The Park also provides parking facilities. (Question 17) I am arriving to Malta on a Cruise Liner, Why do you have a note to contact you before booking online ? Answer: More often than not, many guests on board cruise liners want to book a Swim With Dolphins on the same day and at the same time, however, due to the large numbers of guests on cruise liners and capacity constraints for Swim With Dolphins at the Park, not all these requests may be entertained. Note that there is no transport option from the cruise terminal so you would need to make your way by taxi – the ride should take you roughly 30 minutes each way traffic permitting. We therefore suggest that you Contact Us before proceeding with your booking request. Please contact us by email during office hours (Monday to Friday between 0900hrs and 1700hrs). (Question 18) I wish to book a Swim With Dolphins but I am Pregnant or have a Medical Condition, do I need to inform you ? Answer: Generally the following people cannot Swim With Dolphins for safety reasons:- pregnant women, severely (physical or psychological) impaired people, people with strong physical limitations (example: heart conditions), people with skin disorders, people under the influence of drugs or alcohol, people with hydrophobia, people with any other conditions which may compromise the participant or the dolphin’s well-being. For further information read the Swim With Dolphins Disclaimer. Pregnant women may however participate in the Dolphin Interaction Programme, which is a dry programme, as long as they are comfortable to bend when touching the dolphins. (Question 19) I wish to book a Swim With Dolphins in Winter, is the Pool where I will Swim Heated ? Answer: Unfortunately not, the pool is an outdoor pool and the water temperature is almost identical to the normal sea water temperature. (Question 20) I wish to book a Swim With Dolphins but I use contact lenses, is this OK ? Answer: Yes, as long as the lenses are of the soft type. (Question 21) I wish to book a Swim With Dolphins but I usually use goggles in a pool, can I bring my own ? Answer: Unfortunately not, as not all types of goggles are allowed, however you may ask for an approved type of goggles at the park which will be provided to you prior to your swim with dolphins. (Question 22) I wish to book a Swim With Dolphins or an Interactive Program with Dolphins – Can I wear any loose items such as piercing, necklaces, etc ? 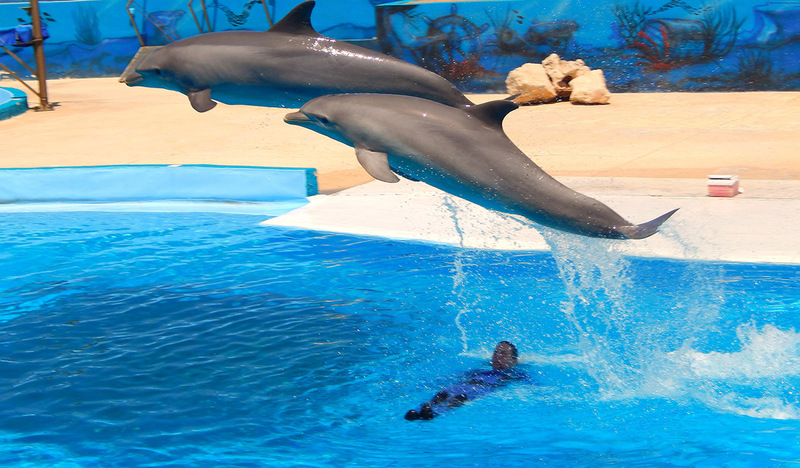 (Question 23) I wish to see the Shows and also Swim With Dolphins, what tickets should I buy ? Answer: The Swim With Dolphins Ticket and the Spectator Ticket includes entrance to the park and entrance to the Dolphin Show Presentation, The Seal Lion Show Presentation, The Parrot Show Presentation and The Reptile House. Therefore you only need to buy the relative number of Swim with Dolphins or Spectator Tickets and you will be entitled free entrance to the shows. (Question 24) I wish to see the Shows and also participate in an Interactive Programme, what tickets should I buy ? Answer: The Interactive Programme Tickets includes entrance to the park and entrance to the Dolphin Show Presentation, The Seal Lion Show Presentation, The Parrot Show Presentation and The Reptile House. Therefore you only need to buy the relative number of Interactive Programme Tickets and you will be entitled free entrance to the shows. (Question 25) I wish to Book for tomorrow, can I do this Online ? Answer: Unfortunately not. Due to availability and logistical issues you must book online at least 4 FULL DAYS IN ADVANCE of the day you wish to visit the Park. We suggest that you book as early as possible to secure availability. (Question 26) I booked online and received a confirmation of payment and details of my request. Do I need any other information to present at the Marine Park ? Answer: Yes. We will send you a booking voucher by email which will include details of your confirmed booking, time of Hotel Pick Up (if booked) and/or the time of the Swim With Dolphins (if booked) and/or the time of the Interactive Dry Programme (if booked). The booking voucher needs to be presented to the park attendants on the day of your booking. If for any reason you cannot print the voucher you can show a copy of the voucher on your smart phone or tablet pc together with the Identity Card, Drivers Licence or Passport of the booker (the lead guest name shown on the booking voucher). (Question 27) I want to Cancel or Modify my booking, what shall I do ? Answer: Should you or any other member of your party need to cancel or modify your booking, you are to inform us in writing during office hours (Monday to Friday between 0900hrs and 1700hrs) by email. Note Cancellation or Modification in booking Fees may apply. Please read clauses 18 and 19 of our Terms & Conditions for further details. (Question 28) What happens if the weather is very bad on the day I am booked ? Answer: In very rare cases the Park may have to close due to adverse weather conditions. In such cases our staff will inform you when this happens and will arrange with you for an alternative booking date. In case of difficulty please contact us during office hours (Monday to Friday between 0900hrs and 1700hrs) by email. (Question 29) Your booking page only provides for a debit card or credit card method of payment, can I pay by swift transfer or cash on arrival ? Answer: Unfortunately not, we only accept bookings paid in advance by internationally recognized debit and credit cards. (Question 30) I wish to make a group booking of more than 10 persons, can I do this online ? Answer: Due to group size limitations we are not in a position to accept online bookings of more than 10 persons. However please contact us during office hours (Monday to Friday between 0900hrs and 1700hrs) by email so that we can handle your group booking offline. (Question 31) Does the Marine Park have a Snack Bar, a Play Area for Infants and Other Facilities ? Answer: Yes the Park has a Cafeteria/Snack Bar, a Play/Amusement Area for young children, a Souvenir Shop and a Min Lab for inhouse development and printing of photos. (Question 32) Does the Marine Park have WIFI Facilities ? Answer: Yes the Park is WIFI enabled. (Question 33) Do you provide booking facilities for Malta Villa Rentals or Malta Apartments To Let? (Question 34) Do you provide booking facilities for Malta Hotels ? (Question 35) Do you provide booking facilities for Malta & Gozo Airport Transfers ? (Question 36) Where can I/We find more information about Malta Weather ? (Question 37) I cannot find the answer I am looking for and it is very urgent. What can i do ? For urgent enquiries please contact us during office hours (Monday to Friday between 0900hrs and 1700hrs). In most cases we can resolve your issue within an hour.